Magnolia species fall into two main types, evergreen magnolias and deciduous magnolias. 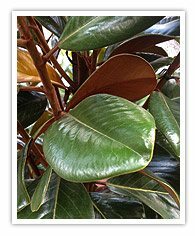 Nearly all evergreen types are cultivars of Magnolia grandiflora. The deciduous types are varied, a number of species and numerous cultivars. However there are hundreds of magnolia species and cultivars on the market. Magnolias may be very large trees, such as Magnolia Grandiflora or small garden specimen types. 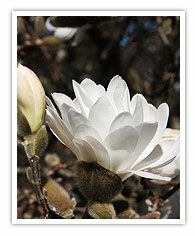 We provide a guide and list to magnolia types and species. Links to Magnolias for sale from specialist nurseries and a guide to planting magnolias. Most of the deciduous types are from China and Japan. The evergreens are mainly from North America and a few other species are from areas including South America, Nepal, India and New Guinea. Most deciduous magnolia cultivars are developed from Chinese and Japanese species. Evergreen magnolia cultivars such as the well known ‘Magnolia Little Gem’ have been developed from Magnolia Grandiflora. Deciduous Magnolias flower in late winter to early spring with flowers forming on bare branches making a spectacular display. Magnolia soulangiana and Magnolia stellata are very popular deciduous forms. These deciduous magnolias make fantastic specimen trees. Evergreen Magnolias are famous for Magnolia Grandiflora ‘Little Gem’. However others exist, larger forms include Magnolia Grandiflora Exmouth and St Marys. Other smaller forms include the newly released Magnolia Grandiflora Kay Parris and Teddy Bear. Evergreen Magnolias make great hedging plants, work well at the back of the garden border and are also suitable a specimen plants. Magnolia species are varied. With both evergreen and deciduous species, along with a variety of flower forms and colours. Magnolias are native to both North and South America as well as China, Nepal, Japan. The Philippines, Vietnam, Thailand, Burma and other asian countries.